This well known uniform item was typically called an "Ike Jacket" as it was designed by General Dwight D. Eisenhower who modeled it after the British battle dress jacket. Ike himself wore the British model and was instrumental in making it a U.S. issue item.. The original World War II uniform was considered by Eisenhower and many others to fit badly as it was restrictive. Ike wanted a "neater and smarter uniform" that could be worn by itself or over layers It was originally intended to be a battle uniform enabling soldiers to fight anywhere in the world. Soldiers soon learned that if worn as a Class-B uniform it enabled them to wear a dress uniform yet avoid the wrinkling that a full length uniform Class-A blouse invariably suffered. Although supposedly designed for combat wear, it became a favorite clothing item in non-combat environments. A standard issue item for U.S. troops beginning in November 1944, it quickly became known as the "Ike jacket" after its creator. Read more. 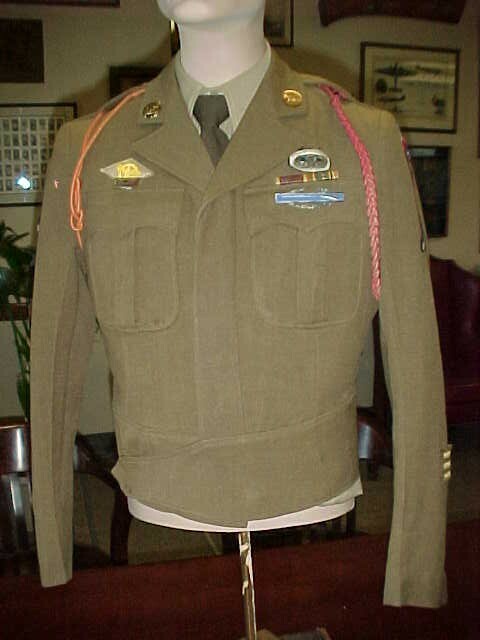 The Ike Jacket shown in this photos once belonged to Pfc. Robert F. Lunzer, I Co., 508 PIR. It is now owned by WW-II paraphernalia collector USAF TSgt Timothy Walker. who recently spotted it displayed for sale. Mr. Lunzer was from Aitken, MN. and died at the age of 72 on June 5, 1998. Despite his passing, his "Ike Jacket" speaks volumes for him and his service. 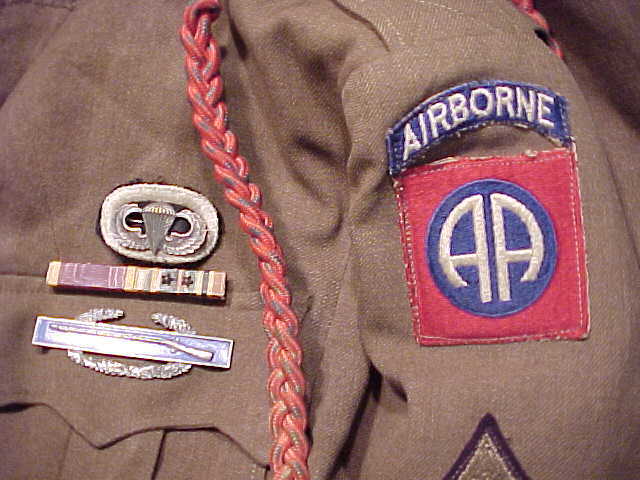 The left sleeve sports the Airborne insignia arching over the All-American Division shoulder patch. Also shown are the prized jump wings on the 508th flash. Although faded, the Belgian Fourragere still hangs proudly on the uniform which also still has well polished collar brass. Also shown are a Purple Heart ribbon and the Europe-Africa-Middle East Campaign ribbon with two campaign stars all mounted above the "CIB" (Combat Infantry Badge). 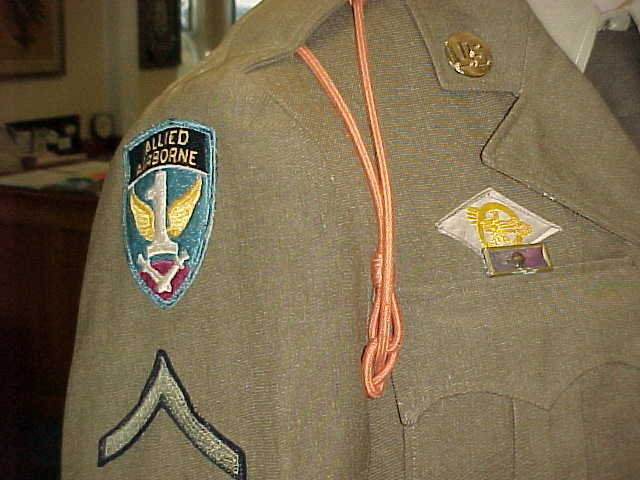 The right shoulder of Mr.. Lunzer's Ike Jacket is adorned with the Netherlands Orange lanyard or, "Militaire Willems Orde, Degree of Knight of the Fourth Class" which was awarded to all 82nd AB Division members who fought in Holland during the award period. 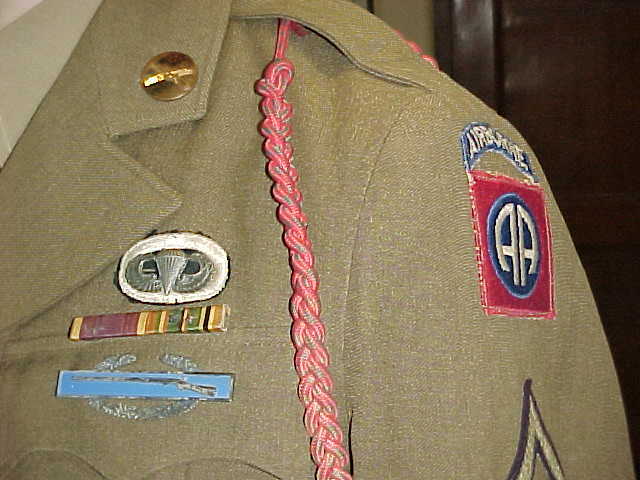 The US Presidential Unit Citation is affixed above the right breast pocket On the right shoulder is the First Allied Airborne patch. The 82nd Airborne was assigned to the 1st AA 12 August 1944 for Operation Market Garden and again in January 1945.. According to jacket collector Tim Walker, the patch worn on the right shoulder of an Ike usually means the combat unit and the patch on the left shoulder means the unit currently assigned. Over the Presidential Unit Citation is the Honorable Discharge emblem, commonly called the :"Ruptured Duck". Mr. Lunzer may have worn this jacket as a member of a post-war veterans group as the "Ruptured Duck" was only awarded to honorably discharged veterans. It may also say something about how long the jacket was worn after his discharge from active service. The G.I. 's thought the eagle looked more like a duck; .hence the nickname.. Also, because it meant they were going home, a popular saying grew out of it as "They took off like a Ruptured Duck"